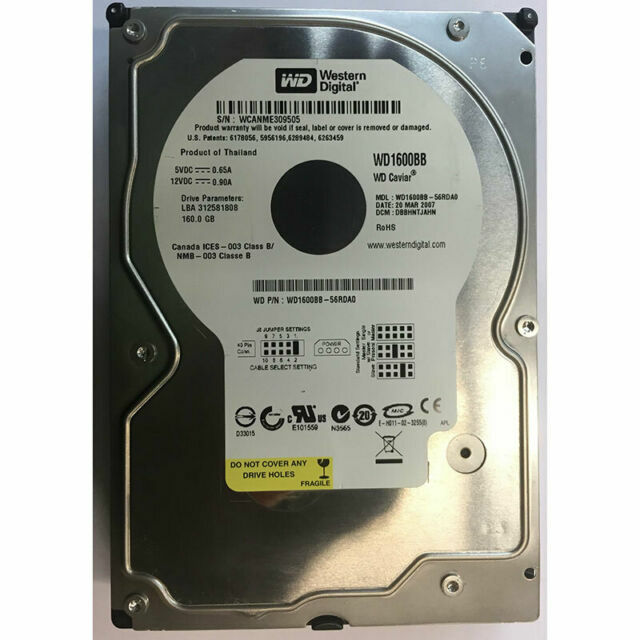 This Western Digital 160 GB hard drive is dependable and high-performing, and it is excellent for those who care about data integrity. This Western Digital 160 GB hard drive is a compelling choice for dealing with large amounts of data. IT professionals and power users alike admire the construction and compatibility of the Western Digital WD1600BB-56RDA0. This internal 3.5-inch hard drive is a breeze to install, which means you are able to simply hook it up to machines that support the Ultra ATA/100 standard. Featuring solid build quality, the Western Digital WD1600BB-56RDA0 is wonderfully durable, so you can enjoy the benefits of years of trouble-free operation without fear of component failures or disk crashes. This internal 3.5-inch hard drive allows you to save large documents, games, and data files without the wait thanks to its nimble 7200 RPM disk speed. Because this Western Digital 160 GB hard drive includes a 2 MB RAM buffer, you can squeeze out super-fast system performance while transferring data, analyzing information, or loading software. In addition, with the sufficient storage capacity featured on the Western Digital WD1600BB-56RDA0, you can save all your favorite photo library, software utilities, and mp3 files without a problem.